I believe that art is a mediation of the world around us. Breaking through traditional forms of art making intrigues me because I don't believe we are simply here to follow guidelines and structures made for artists. I believe we can create our own system that may enable us to truly be free and creative. The evolution of Trifexy has been an organic one and lead to an open forum of trust and honesty between 3 artist friends. For me, Trifexy, has allowed me to dissect various parts of my studio practice in order to bring what I call “elements” into the collaboration without the final works being influenced by anyone other than my own thoughts. These elements help make up sections in Trifexy artwork. The spirit of the collaboration is to bring your own flavor and have fun while you’re doing it, much like living out your dreams and creating a path that is uniquely your own. 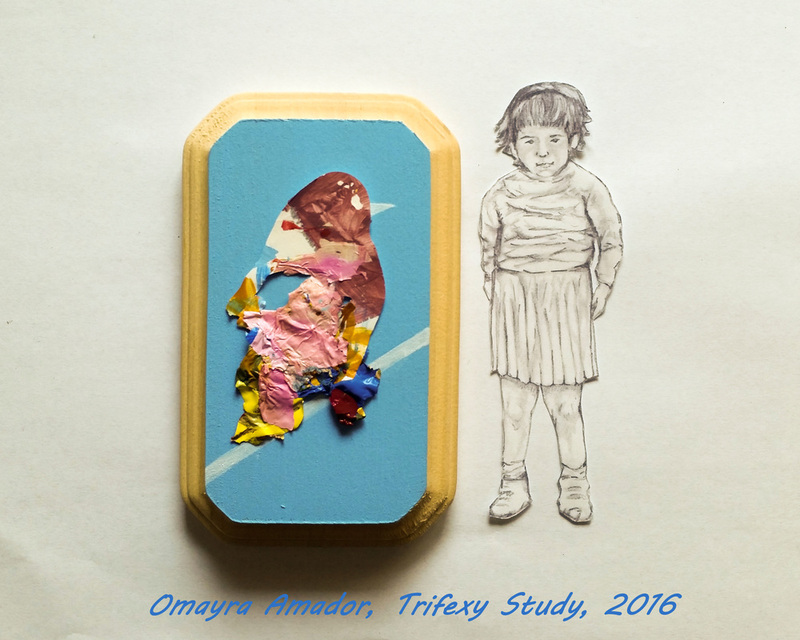 Omayra Amador was raised in New York and received a BFA in Fine Arts from Parsons New School University. Beginning as an Illustration major, she made the switch over to Fine Arts after a semester abroad in Paris, France. She took fine art studio courses, encountered a plethora of street art and was inspired by how it made her stop and stare. That feeling stuck with her. In moving to Las Vegas in 2010, she quickly noticed the lack of street art in the city and especially noticed the male dominated urban art scene. She began the Milk the Bunny street art series in 2013 as a way to introduce her work to Las Vegas. During that time, she also began showcasing in galleries. Her artwork primarily focuses on subject matters that she has personal connections with. Parallel universes, nostalgia and childhood recollections are themes that she is currently examining together and apart as their own entity. In exploring them together, Omayra is interested in how each element creates a familiar sense of belonging. Creating art by any means necessary is Amador's daily goal. Fine art and street art are in the same plateau for her as they inform one another in her current works; in turn creating a world for her subject matters to live in. She will continue to explore the ever-changing traditions of low- and high-brow art.